Since September 2014, Belmont’s Office of Residence Life has encouraged residents to participate in the “Living a Better Story” (LABS) program, designed to challenge students to make a difference in their community using a small amount of money. With new direction by the GPS (Growth & Purpose for Students) office this year, “Living a Better Story” is engaging students and focusing on the sophomore experience in a new and powerful way. Under Residence Life, the program was focused on sophomore buildings, and each hall voted on the organization it wanted to work with through the semester. Last year, the partnerships were Two Oaks with End Slavery Tennessee, Thrailkill with BothHands, Dickens with Monroe Harding, Horrell with Tennessee Voices for Victims and Kennedy with Thistle Farms. Last April, staff members Micah Weedman, Rachel Walden, David Sneed and Tim Stewart selected Kennedy Hall as the 2014-2015 winner for the $1,255 residents raised for Thistle Farms and the creative fundrasiers used to get there. Residents hosted a Thistle Farms party, with more than 50 students in attendance, and managed various fundraisers throughout the year, including DOUBLE DARE 2000, Trash for Cash, Puppy Chow Sales and Candygrams. Belmont awarded the team an additional $3,000 prize to donate to the organization, totaling $4,255 given to Thistle Farms. 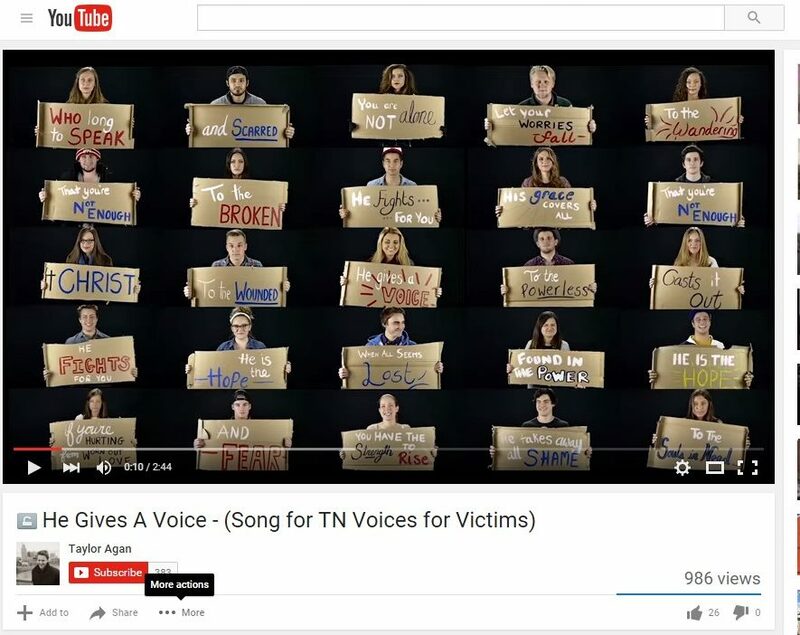 Horrell Hall’s campaign for Tennessee Voices for Victims was featured in an article in The Tennessean, written with gratitude from the organization’s co-founder, Verna Wyatt. Previous Resident Assistant and alumnus Taylor Agan sponsored several events to introduce students to the nonprofit’s work, including collaborating with fellow music majors Hunter Leath and Monica Moser. The students wrote “He Gives a Voice,” a Christian song of hope for anyone struggling with pain or grief. Agan also rounded up the Horrell residents and recruited fellow student Trevor Krulcik to create an inspiring video (shown below) to support and raise money for the campaign. The team uploaded the video to YouTube and created a social media campaign to encourage people to watch the video, download the song and make a donation. Every dollar donated was given to Tennessee Voices For Victims. For the 2015-2016 year, GPS is building on the developments from the past but also incorporating the development of a new student organization, Lambda Sigma – a Sophomore Student Honor Society. The model will be very similar to the past year, but the leadership focus will change. Director of the GPS Program David Sneed explained the goals of the program are two-fold: 1) helping Belmont students further develop their understanding and capacities for creatively giving and 2) helping individuals and non-profit organizations. Developed out of Student Affairs, all freshmen at Belmont are given a $25 donation to partner with KIVA, an organization that connects people around the world through lending to alleviate poverty. “We know that KIVA focuses on the freshman year, and we wanted to develop LABS to be more closely associated with the growth and development of students moving through their sophomore year. We will continue to partner with University Ministries and Residence Life to complete these leadership and educational opportunities,” said Sneed.